This morning I made the short trip to Panama Golf Academy right in the heart of Panama City on via Israel. My uber-taxi found the place really easily and as I was the first customer of the day I was welcomed as if I were a VIP and even had a mini-tour from the friendly guy on the desk. TLDR: A short but well located driving range, useful for a practice session to keep your full swings moving and actually good for short game practice. The setup is simple and somewhat basic, 9 bays downstairs and about the same upstairs. Downstairs one bay has been made into a useful practice bunker and upstairs its a straight forward driving range setup with a simple putting mat across the back. The range is short at just under 130yards from the centre, downstairs bay. Although the range is short, once I’d warmed up I hit some drivers into the back net and it is just about long enough for me to see if it would be a good or a bad shot, even with a driver. Using a table (like this from Golf WRX) you can get an idea about what stage of flight your ball should be at when it reaches 125 yards (where the back net is). 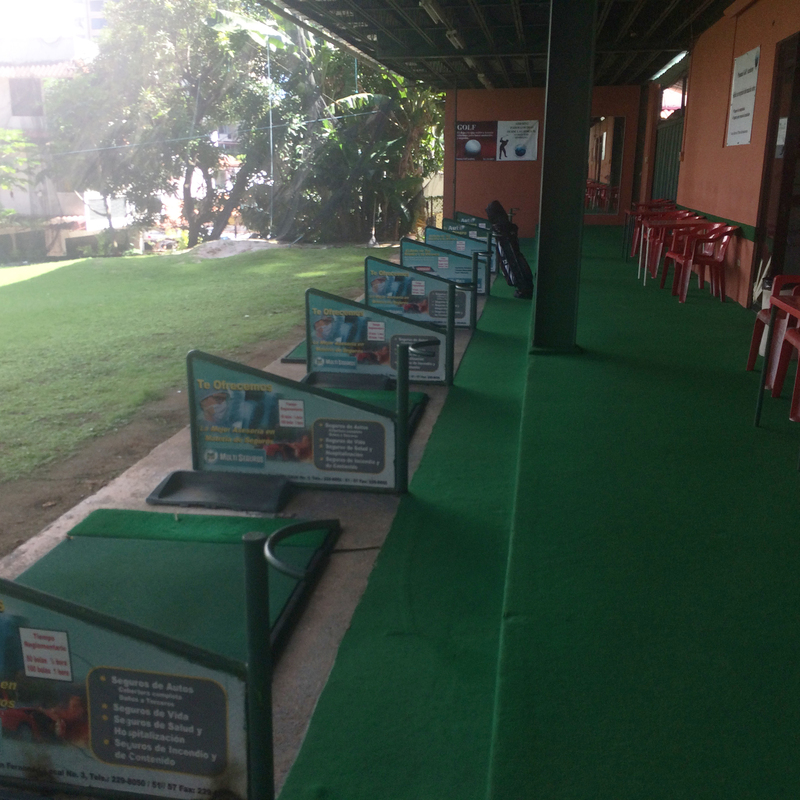 At Panama Golf Academy you can rent or buy used golf clubs and there are basic refreshment available at a sensible price. I am currently available for private golf lessons in Panama Golf Academy. Please email gc@impactgolf.net to make arrangements or telephone (+507) 6219333. Click here to find little more about my golf coaching background. I enjoyed a great warm up to the 45 yard flagstick, using my 60 degree wedge, putting all my efforts into getting a clean strike meant once I moved up to my hybrid I got a real sense of good and bad shots. The ball’s flight and the feel off the club face means the shortened range really isn’t a problem. Finally I used my laser-range finder to measure out all the distances, again from the centre bay, downstairs. I sketched out a plan, I’m no artist but once you’re there this would make sense I’m certain. Along the bottom you see my notes, to remind myself where I was standing. 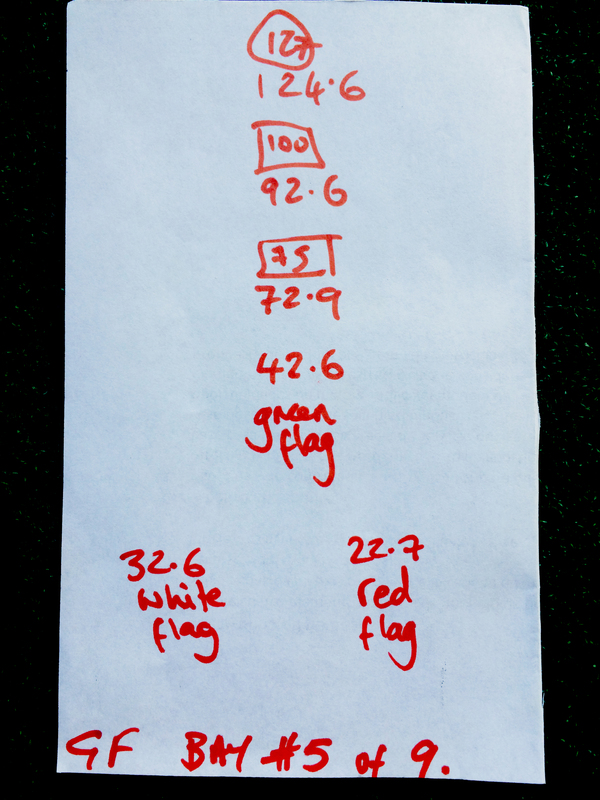 Above that the yardages to the first flags. Then to the Green flag. Then the actual measurement to the numbered boards and finally to the 127 boards hanging high on the back nets. Via Israel, frente al colegio Richard (google maps, waze and uber don’t seem to have this quite right). Prev I’ve got an important game this week! How can I make sure I play well?